Plant tissues. Parenchyma. Atlas of plant and animal histology. Parenchyma is not a highly specialized tissue involved in many functions such as photosynthesis, storage, synthesis and processing of many substances, and tissue repairing. In this tissue, only the parenchymatic cell type is present, which shows a thin primary cell wall. From the evolutionary point of view, the parenchymatic cell is regarded as the ancestor or precursor of the other cell types of the plant because it is not much differentiated and shows similar behavior as meristematic cells. For example, it can dedifferentiate by decreasing the thickness of the cell wall, and becomes a totipotent cell that can proliferate. Thus, parenchyma is an excellent source to produce callus (in vitro mass of undifferentiated cells that proliferate and differentiate to give an adult plant). Parenchyma is a continuous tissue in cortex and medulla of stems and roots, as well as in leaves, fruits pulp, and seeds endosperm. It can account for around 80 % of the living cells of a plant. Some parenchymatic cells are components of the vascular tissues, xylem and phloem. The ability of plant tissues to be repaired after an injury depends partially on parenchymatic cells. Photosynthetic parenchyma of camellia leaf. Phosynthetic parenchyma. This type of parenchyma, also known as chlorenchyma, is specialized in photosynthesis thanks to the many chloroplasts present in the cells. Photosynthetic parenchyma is commonly found under the epidermis, where light is more intense, and it is abundant in leaves, but also in the cortex of green shoots. The photosynthetic parenchyma of the leaves is known as mesophyll, which is usually divided in two types: palisade and spongy mesophyll. Palisade mesophyll is close to the upper epidermis of the leaves, where it gets more light, whereas the spongy mesophyll is in the lower and darker side of the leaves. Parenchymatic cells of the palisade mesophyll are more tightly packaged and contain more chloroplasts, so that the photoshyntetic activity is higher. In the spongy mesophyll, there are more empty intercelular spaces that facilitates the movement of gases and water. Storage parenchyma of buttercup root cortex. Storage parenchyma. The cells in this tissue synthesize and stores a number of substances. Although these substances can be solid, like starch grains and crystallized proteins, they are mostly found in solution, such as lipids, proteins, and others. Usually they are stored in vacuoles, which are the compartment specialized in storing molecules. In the cytoplasm, some moleculares are also stored like carbohydrates and nitrogenated substances. Some parenchymatic cells store only one type of substance, but a mix of different substances can also be found in the same cell. The mos frequent stored molecule is starch. Stored proteins are a good source of nitrogen, which is very important for the plant, and the destiny of these proteins is usually degradation. Aquiferous parenchyma. Although all parenchymatic cells store some amount of water, those of the aquiferous parenchyma are specialized in this function. They are large cells, with a thin cell wall and a very large vacuole where water is stored. In the cytoplasm or in the vacuole, there is a mucilaginous substance that increase the capacity of absorption and retention of water. Aquifereous parenchyma is present in plants that live in dry environments, known as xerophyte plants. Plant underground organs that store nutrients are not specialized in the storing of water, although those cells that contain starch granules or other substances are capable of storing large amount of water. Aeriferous parenchyma of a rush stem. Aeriferous parenchyma (aerenchyma). There are large interconnected empty intercellular spaces, where gases can diffuse and aerate the root. Aeriferous parenchyma or aerenchyma contains large intercelular empty spaces, larger than in other plant tissues. 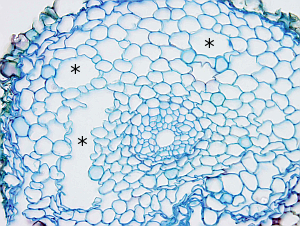 This tissue is well-developed in plants living in wet or aquatic environments (these plants are known as hydrophytes), although it can be also found in non aquatic plants under stress. Both, stem and root can develope aerenchyma. In the roots, two ways of aerenchyma formation have been observed: schizogeny and lysogeny. Schizogeny is a process that occurs by cell differentiation during the development of the organ. 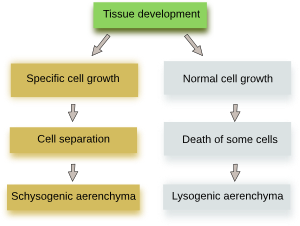 Lysogeny is a consequence of the stress and the intercellular cavities are produced by cell death. Lysogenic aerenchyma is found in wheat, rice, corn and barley. Some authors suggest that a third type known as expansigeny, where the intercellular cavities are by cell retraction, but cells do not loose the physical contacts (see below, figure from Seago et al., 2005). Aerenchyma from the aquatic plant elodea (Elodea canadensis). Asterisks indicate the tissue empty spaces. Two ways for the formation of aerenchyma (modified from Evans, 2003). Aerenchyma is continuous from the stem to the root. The large empty spaces of the tissue allow the movement of gases, increasing the conduction from the leaves to the roots. This communication is vital for plants living in aquatic environments or wet soils for keeping the level oxygen normal for the respiration of root cells. It is also a way for releasing gases like ethylene, from the roots to the environment, through the leaves. Aerenchyma is seen as an adaptation of the plants to hypoxia of wet or flood soils. Plants with aerenchyma are regarded as major participant in the releasing of greenhouse gases to the atmosphere, such as methane, for they can capture these gases from the soil and funnel them through the roots, shoots and leaves. This mechanism is particularly intense in extensive crops like rice. Examples of aerenchyma formation in different species according to Seago et al., 2005. Evans DE. 2003. Aerenchyma formation. New phytologist. 161:35-49. Seago JR JL, Marsh LC, Stevens, KJ, Soukup A, Votrubová O, Enstone D. 2005. A re-examination of the root cortex in wetland flowering plants with respect to aerenchyma. Annals of botany. 96: 565-579.